Chef Chordale cooks lunch at the vegan station. Photo Courtesy of Bailey Smith. 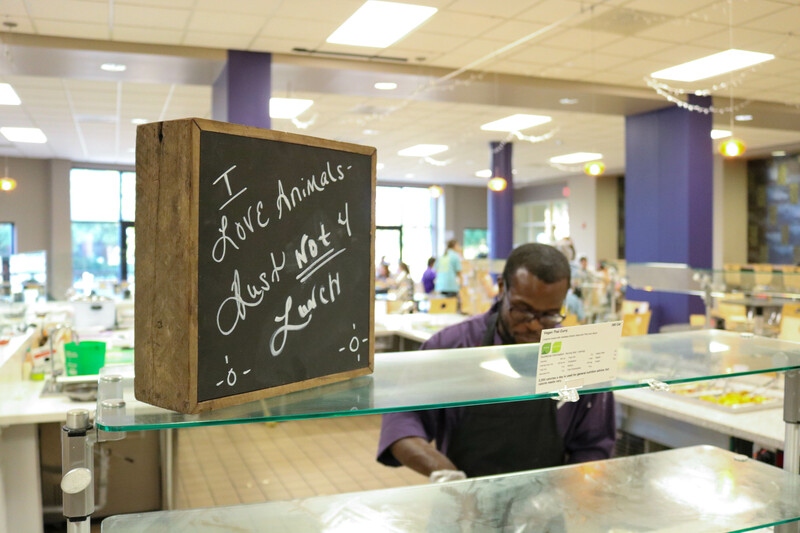 After a strong push from students, including myself, Millsaps has created a completely vegan station in the caf. Though it may not compare to other colleges that have completely vegan cafeterias, it is a huge step in the right direction. I know from personal experience that last year students sometimes had to eat bread and olive oil for dinner or go off campus continually to feed themselves, being forced to spend money that they don’t have. In addition to the ease that it gives for students with different lifestyle choices, it’s an amazing introduction for the non-vegan students to a lifestyle that drastically reduces harm towards animals, the earth, as well as your health. Practices within factory farms and the animal agriculture industry are not well known among the general public, and many students do not have the time to do their own research to learn about them. This is the way the industry would like for them to be kept–hidden. But the agricultural system is inherently cruel, unjust and exploitative in all areas of production–not just the meat industry. The egg industry, for instance, is seen as a viable, ethical option when people become vegetarians, believing that the slaughter of animals for their flesh is the only irreprehensible animal product. The truth is that the egg industry is just as, if not crueler, than the flesh industry. After the chickens are forcefully bred, workers check each chick to see if they are either male or female. If the chicks are male, they will usually place them in a grinder alive or throw them into the trash; in both cases, the chicks are alive and conscious. If female, they will be placed in inhospitable cages with little to no room to move and will have their eggs taken from them each time they release them. The dairy industry uses its own meticulously crafted advertisements to paint an inaccurate, idyllic portrait of dairy farms. The true nature of these facilities is far more alarming than these ads would lead the consumer to believe. Fairlife produced this ad that claims the producers love their animals and that the farm leaves a minimal carbon footprint. These claims fail to align with reality. To have a constant flow of milk coming from the cows, dairy farmers often times artificially inseminate their cows. Once the mother gives birth nine months later, her calf is taken away to be either killed for veal or used just as she was for the production of even more milk. This experience can be extremely tolling emotionally and mentally on both the mother and calf. How can these farmers honestly claim to loves their animals? Are these actions justifiable purely because of the cravings of the customers? These are just a few motives as to why I do not support these practices with my money. There is no justifiable reason that can be given for the violence we commit towards these beings on daily basis. I don’t think you could come up with one if you tried. These are not the only reasons why I choose to not take part in the industry though. Feeding and maintaining billions of animals is immensely taxing on our food supply. In the Fairlife ad above, the cattle farmers feed their cows corn and claim the animals “love [their diet].” A cow’s natural diet consists of grass, not corn, soy or grains. However, this unnatural way of eating is the status quo in today’s factory farms due to the cheap price of these grains as well as the larger cows these foods yield. Producing these foods for livestock is incredibly counterproductive compared to national and world health. There are 795 million people around the world suffering from hunger at this very moment. America alone could feed 1 billion people with the grain and other products that livestock eat, according to a study published in Environmental Research Letters. Not only does factory farming effectively perpetuate the global hunger crisis, but it also pollutes the planet at a higher rate than any other industry in the world. Animal agriculture alone emits 18 percent of all climate change causing greenhouse gases in the world. It is also the leading cause of ocean dead zones, depletion of fisheries, species extinction, and deforestation, making a vegan lifestyle the most effective way to combat climate change. Animal products have been shown to be the exact opposite of healthy. The World Health Organization (WHO) categorized processed meats as a group 1 carcinogen (carcinogen means the substance is cancer causing) two years ago. Processed meats include, “bacon, sausages, hot dogs, salami, corned beef, beef jerky and ham as well as canned meat and meat-based sauces.” The WHO states in an online question and answer that, “This category is used when there is sufficient evidence of carcinogenicity in humans.” Others in this category include tobacco and asbestos (in this case, not as equally dangerous). Though not as strong as a group 1 carcinogen, red meat was classified as a group 2A. Fellow Millsaps students, I encourage you to try out the new vegan station and ask yourself if all of these things are worth the taste of a cheeseburger. Nothing will be missed out on by transitioning to a vegan lifestyle since there are a plethora of vegan cheeseburgers, chicken nuggets, ice creams, cakes, etc. that can be found at any local grocery store and taste just as good as animal-based ones. Only good can come of the decision to adopt a plant-based lifestyle, and you will considerably improve your health, alleviate animal suffering and help save the earth’s ecosystems. Great article! Thanks for sharing this! I have much to learn! This is a brief but effective summary of the numerous reasons to transition to a vegan lifestyle. As a friend of Bailey’s, I can’t help but notice his genuine compassion for animals peaks through this article’s tone without a deficit of research-based information. I encourage readers to further educate themselves and their friends and families on these arguments by reading on the subject and perhaps joining the “plant-based Millsaps” GroupMe chat for updates on vegan options in the caf in addition to a platform for discussing any pertinent thoughts/questions you may have. Well done Bailey! Great article and thank you for your courage to step out and educate as well as petition for change.